In the afternoon of the 7th of March 2011, villagers from Qusra, south of Nablus, were attacked by settlers from the surrounding illegal outposts who shortly were accompanied by the Israeli army. Thirteen Palestinian men were injured and taken to Rafidia hospital in Nablus. Nurses reported that the ambulance staff were prevented from reaching the wounded people. Several of the victims were seriously injured. Ibrahim Hassan, 15 years old, was shot by a live bullet which entered his back and went through his kidney before it exited. His condition is reported to be stable, but he might loose his kidney. Qaher Oude, 25 years old, was first shot in his left leg and then beaten. The settlers beat him on his upper body with stones and sticks and then used a big stone to completely crush his right leg. He will have his surgery tomorrow. “I heard that people were injured, so I went there to help them and suddenly I got shot. The settlers came from nowhere.” Said Qaher Oude. Three farmers were working their land outside the village of Qusra when they were attacked by settlers from the nearby illegal outposts. At 16.30 the village imam called for help for the farmers and the people of the village came to their aid. When villagers arrived four Palestinians were already injured and the Israeli army was there, protecting the settlers. 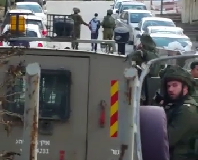 In total, there were about 50 settlers accompanied by the Israeli army. 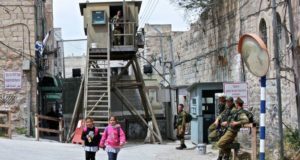 The residents of Qusra reported that the Israeli soldiers did nothing to stop the settler violence, but instead actually took part in the beating and shooting of civilians. Some of the injured people reported they had been shot and beaten by soldiers and some by settlers. “They were shot by Israeli bullets, it’s no difference”. Said one of the villagers. Among the injured in Qusra today were people shot by live ammunition and rubber coated steel bullets, people beaten by settlers and soldiers, and people who suffered the asphyxiating effects of gas inhalation. Qusra with its 4,000 inhabitants is situated 22 km south of the city of Nablus, near the illegal Israeli settlement of Migalim. This is the second serious incident involving violent settlers in Qusra in the last two months.